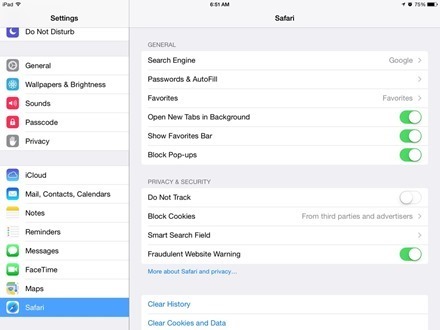 Safari has been a leading mobile browser ever since the first iPhone hit the streets in 2007. It brought us the internet on a mobile device with no compromises and a striking set of new features to enjoy the mobile web with. On the iPad’s bigger screen Safari is an even more compelling experience. It’s clearly one of the most used apps on the iPad and has lead to the iPad dominating among tablets in web browsing share. One of the cool features of Safari that’s not turned on by default is the Favorites Bar – a handy area for one-tap access to your favorite websites, just below the top address bar. — Open the Settings app and scroll down the left sidebar and tap on Safari. 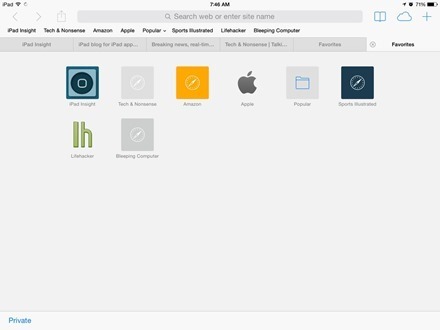 — On the Safari page on the right, towards the bottom of the General section, you’ll see ‘Show Favorites Bar’. Tap to turn it on (the button will be green and white when it is On). 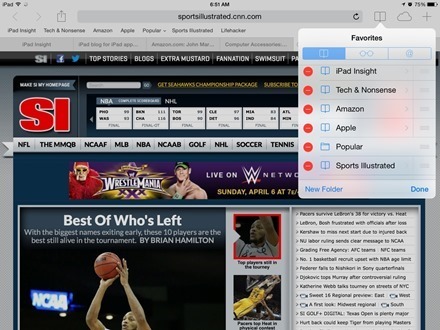 Once you’ve done that you’ll see the Favorites Bar just below the address bar in Safari. Apple starts you off with a few suggested links in the bar – to their own site and a few others. You can keep or get rid of those default sites, and also add and remove sites to customize the bar to your heart’s content. 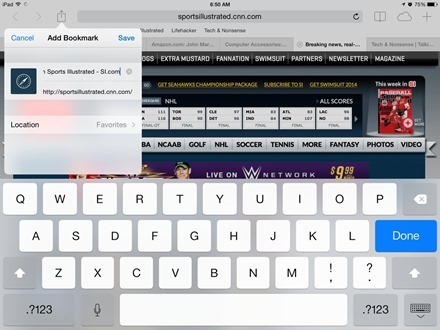 To edit the sites on the Favorites Bar, tap on the Bookmarks button just to the right of the address bar at the top of the Safari screen – shown in the screenshot at the top of this post. Then tap on Favorites, and then on the Edit button at the bottom of the Favorites listing. 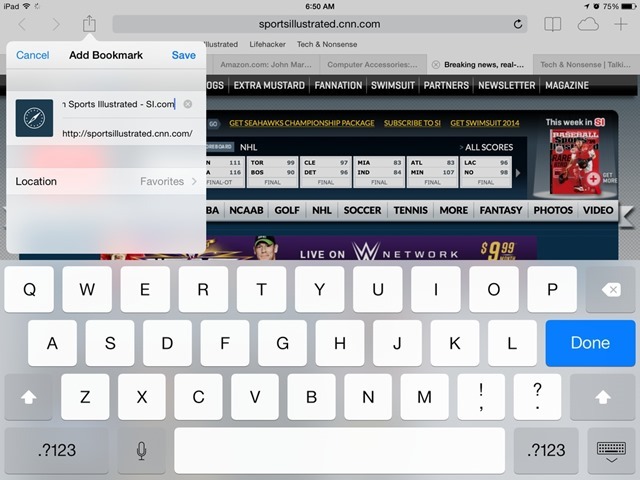 You can then tap on the red minus symbol to the left of any site name to remove that site from the favorites list, tap and hold and drag on the slider control to the right of any site name to move it up or down the list, and hit New Folder to add a new folder to contain a group of favorite sites. To add a site to the Favorites Bar you first go to the site you want to add. 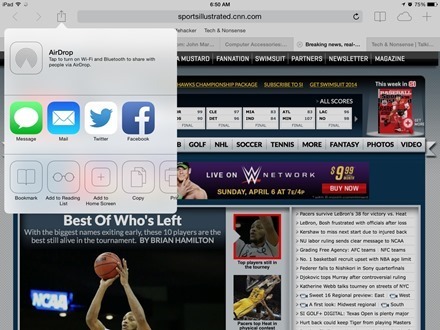 Then tap on the Share button just to the left of the address bar and tap on the Bookmark button in the popup. Next you’ll see the Add Bookmark dialog. On that Popup you can edit the name for the site (they usually contain a long site description that takes up too much space on the bar), and choose the location for the bookmark. That’s where you’ll tell it to place this bookmark on the Favorites Bar. To do so, just tap on the word ‘Location’ at the bottom left of the Add Bookmark popup. 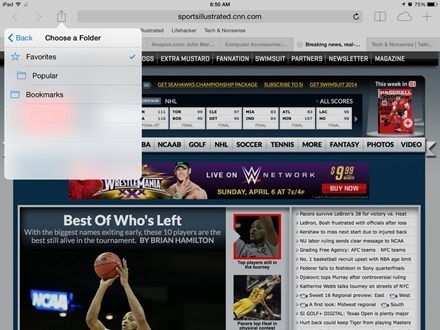 Then tap on Favorites in the Choose Folder popup. And voila, your selection will now be added to the Favorites Bar. What’s on your Favorites Bar in Safari on the iPad?